We would like to offer warm wishes to you for the festive season and hope you have a wonderful Christmas and a happy New Year. Ffestiniog Travel have enjoyed a very busy 2013 – memorable highlights from our escorted tour programme include three successful and popular tours to Romania, an additional tour to Scotland’s Western Isles which we ran due to high demand and our Green Hills of Spain tour, which proved to be such a hit that we will be running it again in 2014. Other repeat tours will include our well established Swiss rail holidays, Indian Hill Railways, and our annual visits to the USA and Canada. A large proportion of 2013 was dedicated to preparing for our 40th Anniversary year in 2014! We began planning our 2014 escorted tour programme back in February and are excited to include a celebratory 40-day ‘Around the World Anniversary’ Tour. This of course was an ambitious challenge, but we have compiled a tour that circumnavigates the Northern Hemisphere and offers a little something for everyone. 40 days is a long journey but Ffestiniog Travel is known for its flexibility and we are able to offer customers the opportunity to experience sections of this grand rail odyssey. 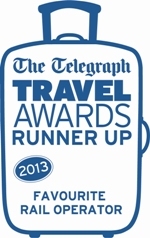 We appreciate your continued support for Ffestiniog Travel and hope our 2014 tour programme appeals to you. Don’t forget that our Tailor Made service can mirror most of our escorted tours at a time that suits you or create your own rail journey from scratch. Our Tailor Made service is a busy part of our business and an enjoyable one as we work closely with customers to ensure every aspect of their holiday is right. Ffestiniog Travel also provide a ticket only service for both rail and flights. Our experienced and enthusiastic team can offer expert advice regarding routes and fares for your planned journey. Our ticketing department is a one stop shop for all your rail and flight ticket needs. Visit www.myrailtrip.co.uk for more information. As a gesture of our appreciation of your on-going custom we will be sending out a token 40th Anniversary commemorative gift to everyone who travels on one of our escorted tours during our Ruby year. Meanwhile all the staff at Ffestiniog Travel would like to wish you a very Merry Christmas, Happy New Year and exciting travels during 2014!